Unless you’re an owl, bat, cat, or other nocturnal animal with exceptional night vision (or maybe you own a pair of night vision goggles), driving after dark is probably more challenging for you than driving during the day. When it’s dark, the road is simply harder to see! According to an industry study cited by MADD, 7 out of 10 drivers in the U.S. get anxious driving at night due to the lack of visibility, with 40% of drivers surveyed worried about hitting a person or an animal, and 25% worried about missing road markings. While your fears are perfectly normal, you can’t realistically avoid driving after sunset, especially during winter. Check out these six tips to help you drive safer (and more worry-free) after dark. Dim your dashboard lights. If the lights on your dashboard are bright, you might unknowingly be compromising your vision on the road. Minimize distractions by using the dashboard dimmer switch in your vehicle. Adjust your headlights and keep them clean. Did you know? Your headlight aim can get “off” and need readjustment from time to time. If you think your headlights are shining unevenly or too low, you’re probably right. Grab your owner’s manual and see if you can readjust them. Or, visit your nearest mechanic and have them take a look. While you’re working on your headlights, wipe them down. Dirt and grime can make your headlights appear dim and foggy. If your headlight bulbs need to be replaced, save some cash and learn how to replace them on your own. Avoid looking into oncoming traffic. You know that temporary blindness you get when a bright camera flash goes off? You can get a version of that same fuzzy vision if you look directly into oncoming headlights. When there’s a car approaching in the opposite lane, try not to look directly into their lights. Think of it like gazing up at a bright summer sky, but NOT looking directly into the sun! Get anti-glare lenses in your glasses. In fact, try not to wear any type of glasses at all, unless you require them for vision correction. If you need your glasses to drive, look into getting anti-glare or anti-reflective lenses. Talk to your eye doctor about the best type of lenses for your driving needs. Clean your windshield. The dust and smudges on your windshield might not cause any issues during the day, but it’s a different story at night. These streaks could cause glare from oncoming headlights, making night driving extremely difficult. Did you know? If you’re short on cleaning materials, you can scrunch up a piece of newspaper to wipe down your windshield! Slow down. Regardless of how safe you drive, it’s simply tougher to see at night and other drivers may not be as cautious as you. Slow down and give yourself more time to react to animals, signs, potholes, and anything else you might miss. It’s understandable that as visibility decreases, your nerves may increase, especially if you’re a new driver or winter weather conditions are kicking up. 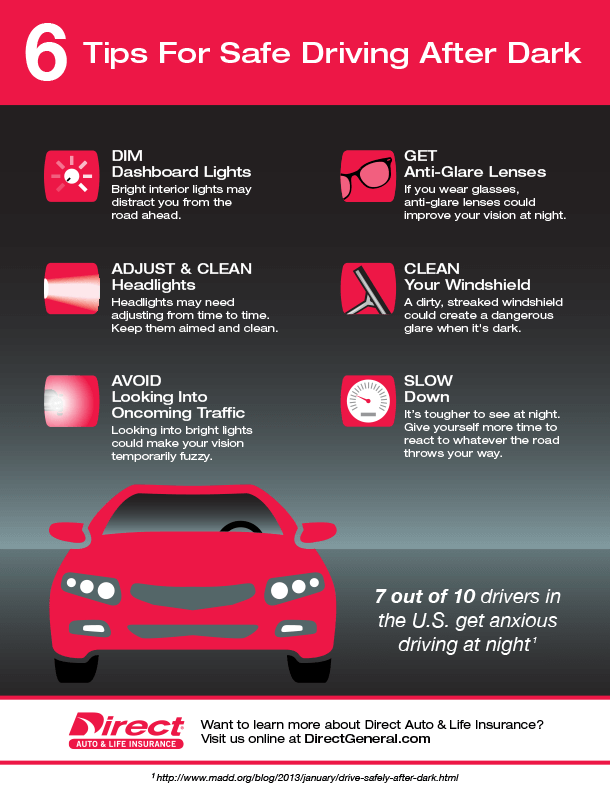 By using these tips when you drive in the dark, you can help calm your night-driving worries. For even more peace of mind, consider a 24/7 Roadside Assistance Plan from Direct Auto & Life Insurance. With tows and jumps available at any hour of the day or night, you can hit the road after dark knowing someone has your back. Call 1-877-GO-DIRECT to learn more today! **Roadside Assistance and Emergency Protection Plans are not insurance and are administered through NationSafeDriver, Boca Raton, FL which is not affiliated with the Direct General Group.